Fanny Mendelssohn (1805-1847, after 1829 Fanny Mendelssohn Hensel), the older sister of Felix, is mentioned in all biographies of her brother as an enthusiastic musician, especially as a pianist, in which capacity she joined with Felix in playing the overture to his early masterpiece, A Midsummer Night’s Dream, which he first conceived for piano four-hands and only orchestrated some years later, when he wrote the rest of the incidental music for Shakespeare’s comedy. Some may have known that Fanny composed songs and piano music, but her father and brother, while encouraging her compositional activity, convinced her that publishing her music was inappropriate to a woman of her social class. Felix did publish some of her songs in one of his sets, but without identifying them as hers. (When Felix had an audience with Queen Victoria during a visit to London, he was forced to confess that Fanny had actually written the queen’s most favored song. In the course of her short life (cut off by a stroke at the age of 41 as parents and brother prematurely), Fanny composed about 500 works, mostly songs and piano pieces, as was typical of women composers in the 19th century, who rarely had performance outlets beyond their own salons. Yet at a surprisingly early age of 26 (in 1831) Fanny composed three larger works for chorus and orchestra, evidently to test her mettle in a more demanding kind of work, though the performing materials were long unavailable (only recently have some large sections of her output been published) and essentially unknown to the musical world. 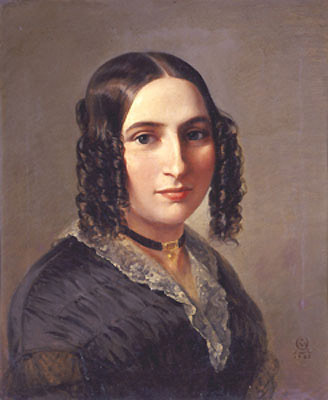 The large choral works alternated with four part-songs (for soprano, alto, tenor, and bass soloists) from Fanny’s last published work, Gartenlieder (Garden Songs), of 1846. Shortly before her unexpected death she decided to ignore the qualms of her father and brother about publishing her music, and she started a project—left very incomplete—to issue various works, mostly songs and piano pieces, under her own name. A different vocal quartet sang each of these four, thereby giving members of Capella Clausura more prominent roles. Unaccompanied quartet songs of this sort existed in great numbers at the time, with examples by Felix Mendelsohn, Schumann, and Brahms, among other less familiar names, especially for the pleasure of music-making in the home or the somewhat more formal salon, or now more increasingly to be sung by choirs. In either case, the poetry emphasizes the beauties of the world in different seasons, or nocturnal moods, the brilliance of the sun or the stars, and tender expressions of passion and yearning. These lyrical quartets offered views of Fanny Mendelssohn Hensel at both early and late stages. The main focus, however, was on the three larger choral works. For these the chorus offered firm projection of the varied moods of the texts (mostly Biblical), linked by recitatives somewhat in the style of Bach, whose cantatas both Felix and Fanny encountered via the Berlin Singakademie. Hiob (Job) draws its text entirely from the relevant book of the Old Testament, laid out in three movements, with a central recitative separating two elaborate choruses. The first two movements raise the existential question: “What is man, that Thou doth make so much of him?” The final chorus is an elaborate, extended expression of confidence, with musically rich contrapuntal structures and fervent expression. Fanny composed the largest and most elaborate of the three in response to a cholera epidemic in the summer of 1831 that took many lives. It is larger in terms of the number of movements (16), the size of the chorus, divided into eight parts rather than the four of the earlier cantatas, and the size of the orchestra, to which brasses are added for the climactic ending. The cries of those tormented with disease colors the mood of the opening sections, with pleas for help and for release from torments. Near the middle (tenth movement) comes a chorus of mourners to a text that will strike many listeners as familiar, because Brahms used it, a quarter century later, for the second movement of his German Requiem. At this emotional point the work, turns from lamentation for the departed to an expression of God’s compassion and mercy. The cantata climaxes with a superb, extended chorus of celebration one text partly drawn from Psalm 150, with the chorus and enlarged orchestra in full array. These three striking works by a very gifted young woman of 26 made for a satisfying program, both because of the expressive variety and range of the three principal pieces and also for the expressivity of the Capella Clausura. Amelia LeClair shaped and blended well, responding firmly and appropriately to the changing expressive texts of these mostly Biblical texts, making the case that Fanny’s voice deserves a place in the canon.